Since we got married nearly 2 years ago, we’ve tried to reduce the amount we eat out (not great when you have a food blog that relies on you eating out! ), so when we do eat out, we like to go to slightly more interesting place. This obviously becomes an issue when it comes to Valentines as most of the really cool places have set menu’s on offer, so this year we decided to go out the day after Valentines instead. This meant that Valentines Day involved me cooking a 3-course meal (see my Instagram page for photos) and Mr R got to pick the venue for our dinner date. For those who have been reading my blog for some time, you will know that Mr R enjoys a good surprise and true to form, he gave me a place to meet him and then proceeded to walk me through the most random route (which included walking through china town) whilst I looked around, bringing up restaurant names, trying to figure out where we were going. When we finally arrived at Broadwick St I spotted a new addition, situated next to Yauatcha which just happened to be where we were headed. We walked through the two massive glass doors into the bar area which was fairly sparse, giving nothing away about the restaurant below. We checked in with the host and were quickly shown to our seats. At this point, Mr R pointed out that he’d asked for seats at the bar so we could watch the way the food was cooked up close – a great idea which meant we picked up some great tips. 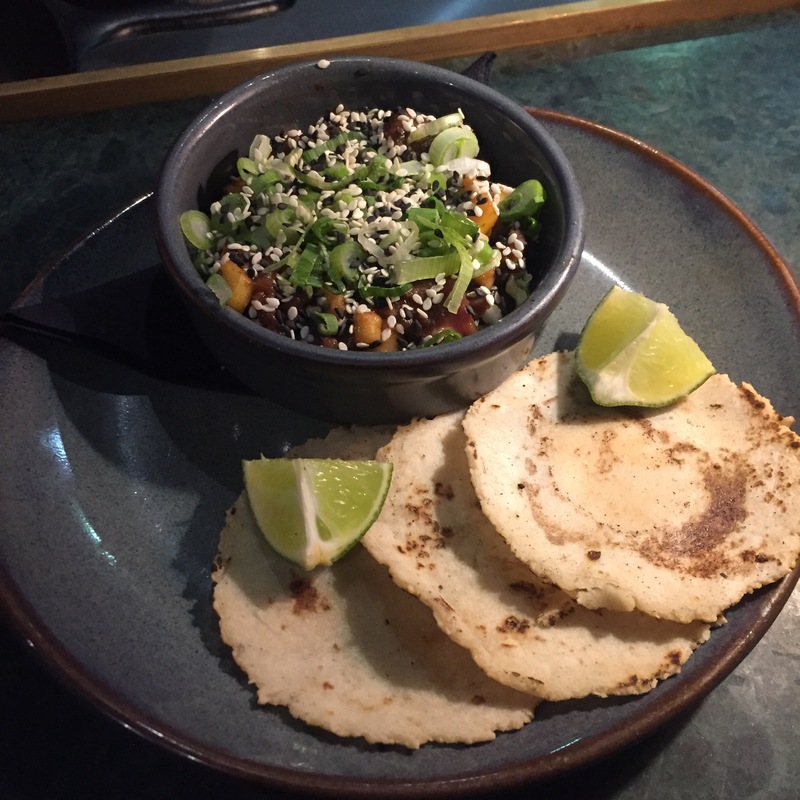 Once we had settled into our seats, our friendly waiter came over to explain how the menu worked, suggesting we picked 2 tacos, 200g each of the chopped, smoked and grilled meat i.e. 4 portions, 2 starters/veg and then he would suggest some sauces and sprinkles depending on our selections. He then left us to our own devices for 10 minutes whilst we made our decision. After regaining his attention, we managed to order our tacos, all 3 of which arrived in one go. First up was the Aged Cheeseburger Taco which was a very well cooked beef burger which had been cut in half and served on two mini tacos. Although the photo does the dish absolutely no credit at all, the meat was really juicy whilst the sauces and chopped red onion added an extra level of flavour. Next up was the Pil Pil Prawns. The portion contained 3 deshelled, head on prawns in some garlic oil and a portion of aioli on the side. Honestly, the flavour was in the oil and in my opinion the oil could have done with a little more garlic. The prawns were however cooked to perfection as one would expect when paying £9 for a dish. Next up was the soy-cured beef. So on the menu, this was the taco option I was most excited about, but sadly, in reality, this was the taco option that impressed me the least. Whilst the beef was well cooked, the dish lacked any real flavour. Having consumed our starters, it was time to order our mains. Our friendly waiter came over again and we decided to go with his suggestion and went for one each of the Lamb, Goat, Pork and Beef (clockwise from top left). Along with these, we ordered with a few different sides, namely the Burratta, lime & jalapeno; the Green Sauce; the Grilled corn, lamb fat bearnaise & mint and the Beef fat potatoes with melted Ogleshield, all of which can be seen in the photo below. We were also convinced to go with the Chipotle sour cream and the Pork, habanero and pickled onion (sprinkles). With regard to the meats, the goat was surprisingly good, full of flavour and well cooked whilst the steak was cooked and seasoned perfectly. The pork for me was ok, it was slightly fatty but the portion size was healthy and on the whole, it worked well with the two sauces we had been recommended. The lamb, however, was a bit of a let down for me, it lacked flavour and seasoning and was also slightly chewy. With regard to the sides, our waiter had suggested trying the potatoes with the chipotle sour cream and a topping of the sprinkle we had ordered (which were basically crushed down pickled onion monster munch). This combo worked superbly and bought an extra dimension of flavour to what was essentially potatoes topped with raclette cheese. The burrata was a must try, purely because of my love of the stuff but upon trying it, I didn’t really understand how it actually fitted into the mix. It was however as creamy as would be expected. My favourite side was actually the Grilled Corn. It was bursting with flavours with the mix of the bbq burntness and the lime, mint, lamb fat and hint of chilli that had obviously played their parts. Having consumed somewhere close to our body weight in food (or maybe just mine), we decided to have a look at the dessert menu. Whilst conducting his preliminary research Mr R had read numerous websites, blogs and reviews of Temper (he is a business analyst after all) and one of the must order dishes was the baked cookie dough. So regardless of how full we were, we decided we must do as told, and order the cookie dough. What arrived was a small skillet with a cookie that was crispy on the outside and super soft and almost runny on the inside. The taste was a combination of sweet and salty but my God was it good. Mr R the “no sugar in my tea” one out of the two of us found it slightly too sweet. I ate most of it without the ice cream and if I were to go back I think I’d get it sans ice cream as it was just too good by itself! To accompany the cookie, I ordered a peppermint tea and Mr R ordered a latte and then got the bill. Temper is a full on meat fest, with absolutely no chicken on the menu and a limited amount of veg, it’s definitely not one for vegetarians or anyone who doesn’t eat red meat. Talking of meat, it was mostly well cooked and the slow cooked nature meant certain dishes had a smokey flavour. My only vice, however, was the fact that most of the dishes were dry and even the sauce pots were small so after my third helping on mains, I found myself wanting something a bit saucy. So my top tip is to order a vast selection of sauces to keep your meat well lubricated! Would I go back? Yes, even if I just ordered 3 portions of the cheeseburger, 2 portions of the sweet corn and 1 cookie to top it all off!